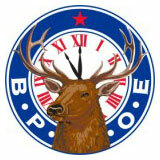 TRI-CITY ELKS GOLF TOURNAMENT WILL BE HELD ON FRIDAY JUNE 3rd. Attached are the sign up sheet and rules. We will be playing at the Broadlands again this year. Lunch will be served following play. And of coarse we will have lots of golf raffles! Thank you Don Blunn and crew for getting this all together again in 2016!